My life has been taken over! I know the feeling. Do they have groups for moms that look forward to and record episodes of Hannah Montana? Just curious...for a friend of mine ;)! Not me of course. With bubba being sick...no lame excuse...we watch DORA EVERY SINGLE DAY! Honestly its the best drug ever! 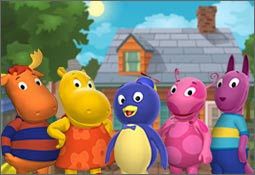 I love the Backyardigans. And, I truly do understand what you mean. Here I am hours and hours after getting back from Dora Live and I can still hear the songs in my head. Ooh... sorry girl. It's the same at our house: SpongeBob friggin RULES. I truly understand. As soon as we walk in the door in the evening I automatically turn to something for him. He has taken over my living room tv. I know what you mean! Ari's into Backyardigans (saw video of Kiddo dancing to the theme song and has been hooked ever since) and Ni Hao Kai-Lan. I love Phineas and Ferb, Spongebob, and Yo Gabba Gabba. That's a very well known feeling to me too :) Just that we don't watch TV at all, but we can hardly find time for anything but the child.